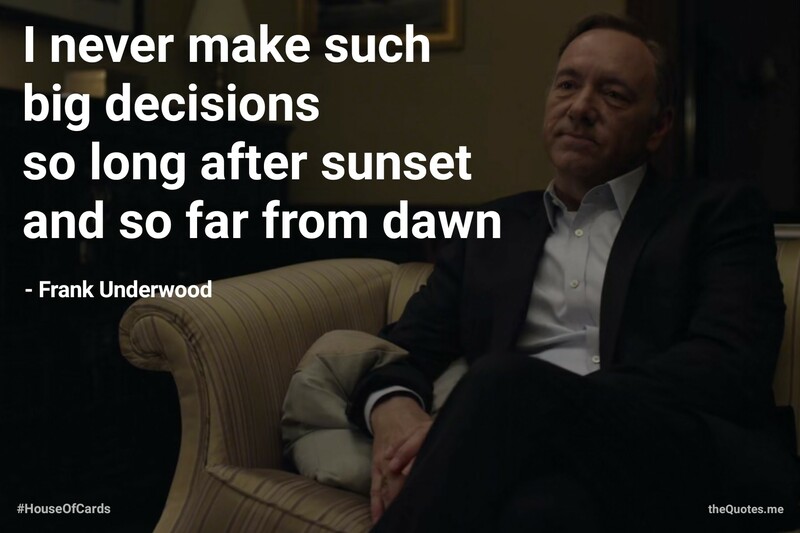 Frank Underwood gave the lesson of life time. Never take decisions in a hurry. Sleep on it, let your brain incubate then regenerate the ideas. I never make such big decisions so long after sunset and so far from dawn. Author theQuotes.mePosted on February 5, 2018 February 9, 2018 Categories Actors, Frank Underwood, House Of Cards, Kevin Spacey, TV ShowsTags abuse of power, Apologize, avenge, Be Ready, Beau Willimon, Boris McGiver, breaking the fourth wall, Capitol Building, Catherine Durant, Chapter 1, Christina Gallagher, Claire Underwood, Congress, congressman, Constance Zimmer, Corey Stoll, corruption, cunning, David Fincher, dawn, decide, decision, dirty politics, Doug Stamper, Drama, duplicity, dusk, embrace, Episode 1, evil, Fall, Frank Underwood, Garrett Walker, House Of Cards, Janine Skorsky, Jayne Atkinson, Kate Mara, Kevin Spacey, Kristen Connolly, Linda Vasquez, Lucas Goodwin, machiavellianism, make decision, media, Michael Dobbs, Michael Kelly, Michel Gill, Netflix, Netflix Original, Netflix Original Series, Netflix Show, never, no mercy, Pain, Peter Russo, plan, political drama, political science, political-corruption, political-power, Politics, Power, President, press, remake-of-british-series, Revenge, rise, rise and fall, Robin Wright, ruthless, Sakina Jaffrey, Season 1, Sebastian Arcelus, Secretary of State, so far from dawn, so long after sunset, strategy, Suffering, sunset, Tom Hammerschmidt, TV Series, TV Show, TV Soap, vice-president, Washington, washington dc, Washington Herald, year 2013, Zoe BarnesLeave a comment on When do you decide?